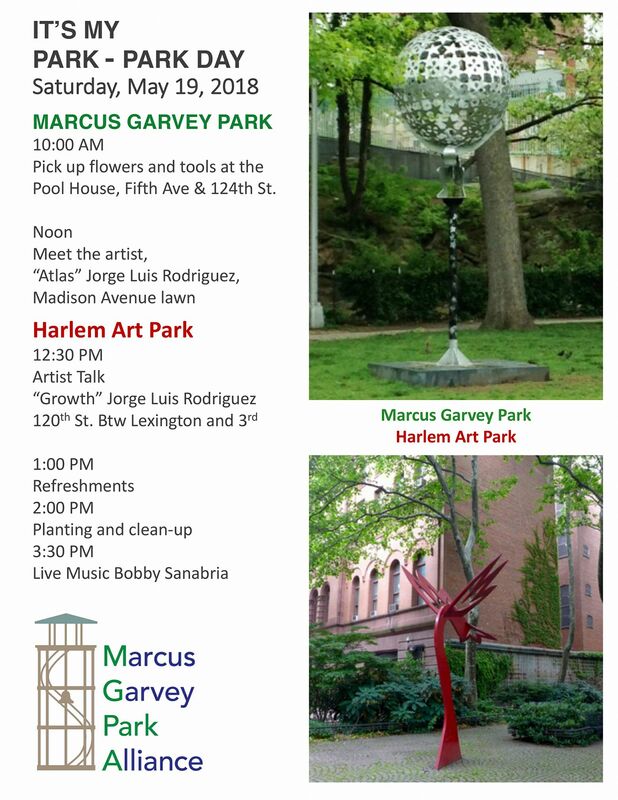 It’s My Park ~ Park Day has been RESCHEDULED DUE TO WEATHER to Saturday, May 26th ~ Sign in at 12:30pm at 124th Street and 5th Avenue pool house. This is an annual appeal, however these two Parks have active groups with continuous needs for new volunteer members, and so ~ this is also a chance to get onboard with each local organization ~ Friends of Art Park Alliance and The Marcus Garvey Park Alliance. Pictured above, the art installation Atlas of the Third Millennium by artist Jorge Luis Rodriguez (on view to October, 2018) through Public Art Initiative, an arm of the Marcus Garvey Park Alliance. Pictured below Atlas is Growth, a permanent sculpture, installed 33 years prior to the installation of Atlas, by the same artist. Growth, located in Harlem Art Park. It was the first Percent for Art installation in New York (c. 1985). Stay connected with each Park, as Marcus Garvey Park looks forward to receiving eight site-specific sculptures entitled Mindful Monuments, this summer by the local sculpture artist, Maren Hassinger. The Mindful Monuments project is in partnership with Studio Museum in Harlem’s inHarlem program ~ art outside its walls. And Harlem Art Park, which had a recent Call-for-Artists (stay tuned). Follow the Marcus Garvey Park Alliance on Facebook, Twitter and Instagram. Follow Panama the Gardner on Instagram at #PanamaTheGardener; Follow Public Art Initiative on Facebook and on its website. Follow Harlem Art Park and the Friends of Art Park Alliance on Facebook. Can’t close this post without a Congratulations to Connie Lee, President of Marcus Garvey Park Alliance/Public Art Initiative for receiving The Golden Trowel Award for Manhattan from Partnerships for Parks, NYC Parks Department, and for the recent success of Landmarks East Harlem on the Landmarking of three buildings in East Harlem. Marcus Garvey Park is also looking forward to the return of the historic Harlem Fire Watchtower later this year. When you’re finished, head over to the 26th Annual Ethnic Festival on East 104th Street on Saturday, May 19th, and Harlem EatUp! on Saturday and Sunday, May 19-20.